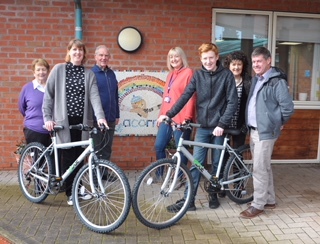 Members of Worcester’s favourite, Kays Panto, have visited Acorns Hospice to donate two bicycles which were used during their recent panto, Aladdin. Kays have also pledged to support Acorns with a donation from the profits of the show together with the proceeds of front of house raffle during the run of the Aladdin. Plans are well under way for Kays’ next panto, Jack and the Beanstalk to be staged at The Swan Theatre, Worcester; 17-27 January 2019. If you fancy being involved in the panto next year, whether on the stage or behind the scenes, come along to our friendly get togethers on 24 or 31 May at Perdiswell Young People’s Leisure Club at 7.30 pm; you’ll be sure of a warm welcome.